DNA – The molecule that defines you Before a cell can divide and make a new cell, it must first duplicate its DNA. This process is called DNA replication. Let's start learning about DNA replication and find out what mechanism is involved in it. In April 1953, James Watson and Francis Crick shook the scientific world with an elegant double–helical model for the structure of Deoxyribonucleic acid, or DNA. Over past 60 years, their model has evolved from a novel premise to an icon of modern biology. 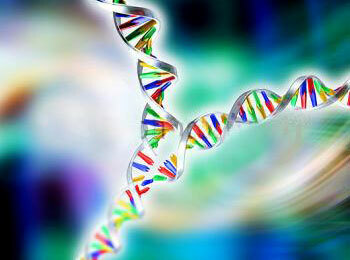 DNA, the substance of inheritance, is the most celebrated molecule of our time. The greatest achievements of nature to date was surely the invention of the molecule DNA. All organisms must duplicate their DNA with extraordinary accuracy before each cell division. In this topic, we explore how an elaborate "replication machine" achieves this accuracy, while duplicating DNA at rates as high as 1000 nucleotides per second. DNA replication is the process of producing two identical copies from one original DNA molecule. This biological process occurs in all living organisms and is the basis for biological inheritance. 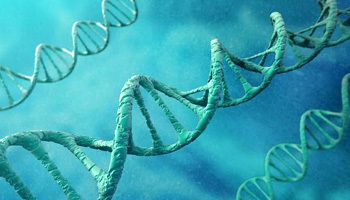 DNA is composed of two strands and each strand of the original DNA molecule serves as template for the production of the complementary strand, a process referred to as semiconservative replication. In humans, for example, each parent cell must copy its entire six billion base pairs of DNA before undergoing mitosis. The smartest molecule in existence! DNA molecule performs so many intelligent functions so effortlessly. "To understand the process of DNA replication, we must first be familiar with the structure of DNA. So, lets have an overview of DNA structure and its functions". 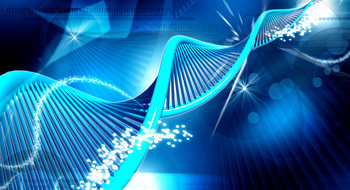 DNA is the molecule that passes on our genetic information. The publication of its structure on the 25th of April 1953 was vital to understanding how it achieves this task with such startling efficiency. 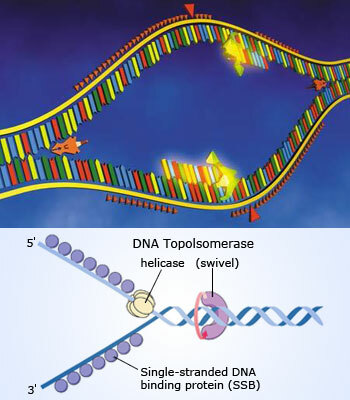 Resembling a twisted ladder or a zipper, DNA is a double helix formed with nucleotides (structural units of DNA containing a base, a sugar, and one or more phosphates), a phosphate and sugar backbone, and nitrogenous bases. There are four bases, and each one will only bond with its complement. Adenine will only bond with Thymine, and Cytosine with only Guanine. The double helix is anti – parallel, meaning each strand runs in a different direction. The twisted &apos;rails&apos; are made of sugar–phosphate, which give DNA its shape and protect the information carrying &apos;rungs&apos; (A level in a hierarchical structure) inside. Each sugar–phosphate unit is joined to the next by a tough covalent bond, which needs a lot of energy to break. In between the &apos;rails&apos;, weaker hydrogen bonds link the two halves of the rungs together. Individually each hydrogen bond is weak – but there are thousands of hydrogen bonds within a single DNA molecule, so the combined effect is an extremely powerful stabilizing force. The sugar–phosphate backbone is illustrated in red, as the sides of the ladder. The base pairs are represented as rungs of the ladder. Adenine (A) is complementary to thymine (T), and guanine (G) is complementary to cytosine (C). The two strands of DNA are antiparallel. 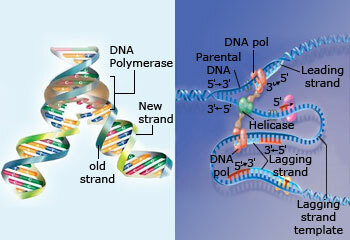 Most double–stranded DNA is found in a right–handed helix (shown on the right). One full turn of a typical DNA helix is 3.4 nm, encompassing approximately 10 base pairs per turn. The width of the helix is approximately 2 nm. DNA Replication in action Replication is the process by which a cell copies its DNA prior to cell division. Replication is the process by which a cell copies its DNA prior to division. In humans, for example, each parent cell must copy its entire six billion base pairs of DNA before undergoing mitosis. DNA replication is a complex process requiring the intricately timed interaction of a large number of enzymes and accessory binding proteins. 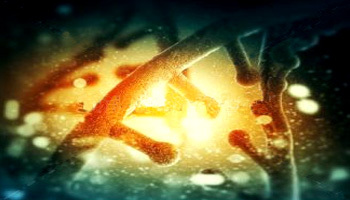 Scientists have devoted decades of effort to understand how DNA replicates itself. In simple terms, replication involves use of an existing strand of DNA as a template for the synthesis of a new, identical strand. The study of DNA replication started almost as soon as the structure of DNA was elucidated, and it continues to this day. American enzymologist and Nobel Prize winner Arthur Kornberg compared DNA replication process to a tape recording of instructions for performing a task: "Exact copies can be made from it, as from a tape recording”. In reality, the process of replication is far more complex than suggested by Kornberg's analogy. Researchers typically utilize simple bacterial cells in their experiments, but they still do not have all the answers, particularly when it comes to eukaryotic replication. Nonetheless, scientists are familiar with the basic steps in the replication process, and they continue to rely on this information as the basis for continued research and experimentation. Now, let's start with the molecular mechanism involved in DNA replication. Principle of DNA Replication "The basic principle of DNA replication is elegantly simple. However, the actual process involves some complicated biochemical gymnastics, as we will see now........."
DNA carries the information for making all of the cell's proteins. These proteins implement all of the functions of a living organism and determine the organism's characteristics. When the cell reproduces, it has to pass all of this information on to the daughter cells. Before a cell can reproduce, it must first replicate, or make a copy of, its DNA. Before going into details of molecular mechanism, it is important to understand the basics regarding DNA replication. 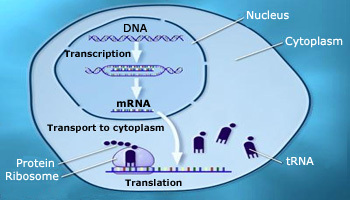 DNA replication occurs in the cytoplasm of prokaryotes and in the nucleus of eukaryotes. Regardless of where DNA replication occurs, the basic process is the same. 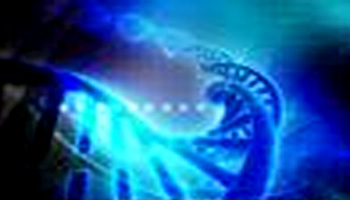 Ori site The replication of a DNA molecule begins at special sites called origins of replication. The structure of DNA lends itself easily to DNA replication. Each side of the double helix runs in opposite (anti–parallel) directions. The beauty of this structure is that it can unzip down the middle and each side can serve as a pattern or template for the other side (called semi–conservative replication). However, DNA does not unzip entirely. It unzips in a small area called a replication fork, which then moves down the entire length of the molecule. DNA replication involves an incredibly sophisticated, highly coordinated series of molecular events. These events are divided into four major stages: unwinding, initiation, primer synthesis, and elongation. Now, let's look into details. DNA unwinding Unwinding enzymes called DNA helicases cause the two parent DNA strands to unwind and separate from one another in both directions at this site to form two "Y"-shaped replication forks. These replication forks are the actual site of DNA copying. For each and every phenomenon, there will be a starting point, which we call as origin point. The replication of a DNA molecule begins at special sites called origins of replication. The origin of replication is a particular sequence in a genome at which replication is initiated. DNA replication may proceed from this point bidirectionally or unidirectionally. The specific structure of the origin of replication varies somewhat from species to species, but all share some common characteristics such as high AT content. Role of DNA helicases DNA helicase are the enzymes that unwinds DNA by binding to the template at each replication fork and moving in the 5' to 3' direction along the strand. How DNA unwinds and get ready for replication? During initiation, so–called initiator proteins bind to the replication origin, a base–pair sequence of nucleotides known as oriC. This binding triggers events that unwind the DNA double helix into two single–stranded DNA molecules. Several groups of proteins are involved in this unwinding. The first proteins or enzymes comes to play are – DNA helicases, which are responsible for breaking the hydrogen bonds that join the complementary nucleotide bases to each other. Because the newly unwound single strands have a tendency to rejoin, another group of proteins, the single–strand–binding proteins (SSB proteins), keep the single strands stable until elongation begins. A third family of proteins, the topoisomerases, reduce some of the torsional strain caused by the unwinding of the double helix. As previously mentioned, the location at which a DNA strand begins to unwind into two separate single strands is known as the origin of replication. 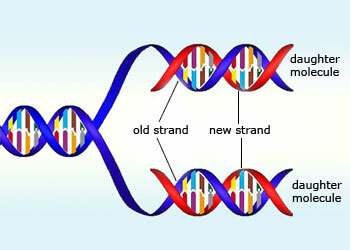 As shown in figure below, when the double helix unwinds, replication proceeds along the two single strands at the same time but in opposite directions (i.e., left to right on one strand, and right to left on the other). This forms two replication forks that move along the DNA, replicating as they go. Scheme of the replication fork a: Template, b: leading strand, c: lagging strand, d: replication fork, e: primer, f: Okazaki fragments. Now, let's start understanding this terminology. The replication fork is a structure that forms within the nucleus during DNA replication. It is created by helicases, which break the hydrogen bonds holding the two DNA strands together. The resulting structure has two branching "prongs", each one made up of a single strand of DNA. These two strands serve as the template for the leading and lagging strands (read further to know what are leading and lagging strands). DNA is always synthesized in the 5' to 3' direction. DNA template is the DNA region (target) to be amplified. The leading strand is the strand of nascent DNA which has been synthesized in the same direction as the growing replication fork. The lagging strand is the strand of nascent DNA whose direction of synthesis is opposite to the direction of the growing replication fork. The leading strand directs continuous synthesis of the new strand, whereas the lagging strand directs discontinuous DNA synthesis. 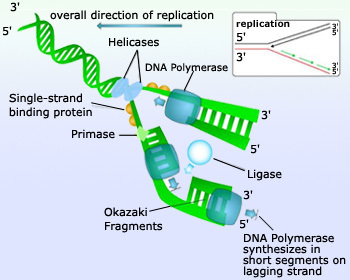 The fragments of DNA generated from the lagging strand are referred to as Okazaki fragments. A primer is a strand of nucleic acid that serves as a starting point for DNA synthesis. The Leading strand is synthesized in the same direction as the movement of the replication fork, and the lagging strand is synthesized in the opposite direction. DNA ligase is a specific type of enzyme, that facilitates the joining of DNA strands together by catalyzing the formation of a phosphodiester bond. It plays a role in repairing single–strand breaks in duplex DNA in living organisms. Primase is an enzyme that synthesizes short RNA sequences (RNA primers) called primers. These primers serve as a starting point for DNA synthesis. Molecular mechanisms involved in DNA Replication DNA polymerases adds nucleotides to the 3' end of a strand of DNA. If a mismatch is accidentally incorporated, the polymerase is inhibited from further extension. Proofreading removes the mismatched nucleotide and extension continues. The addition of nucleotides to the new DNA strand—begins after the primer has been added. Synthesis of the growing strand involves adding nucleotides, one by one, in the exact order specified by the original (template) strand. Recall that one of the key features of the Watson–Crick DNA model is that adenine is always paired with thymine and cytosine is always paired with guanine. So, for example, if the original strand reads A–G–C–T, the new strand will read T–C–G–A. DNA is always synthesized in the 5'–to–3' direction, meaning that nucleotides are added only to the 3' end of the growing strand. 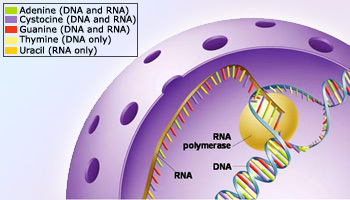 Function of DNA polymerase The main function of DNA polymerase is to synthesize DNA nucleotides and DNA repair. Normal DNA replication is extremely accurate; on average, just one error occurs for every 10 million nucleotides copied. This low error rate arises from the activity of DNA polymerase itself. 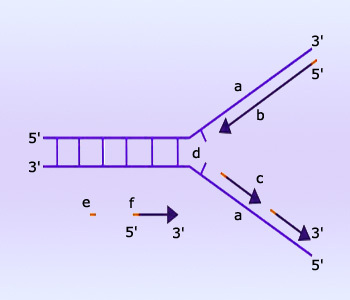 In addition to the 5' to 3' polymerase activity that elongates a DNA strand, the polymerase contains a proofreading activity that can recognize and remove a misplaced nucleotide. Although A–T and G–C are the normal base pairs in double–stranded DNA, mismatched base pair combinations are possible and occasionally do arise during replication. As replication proceeds, however, the proofreading activity of DNA polymerase edits and corrects any newly formed mismatched base pairs. DNA polymerase has two catalytic sites: one site containing the 5' to 3' polymerization activity and the other site containing a DNA degradation activity that can cleave a nucleotide from the 3' end of a DNA strand (3' to 5' exonuclease). Role of Primase Enzyme primase, synthesizes a strand of nucleic acid complementary to the template strand. 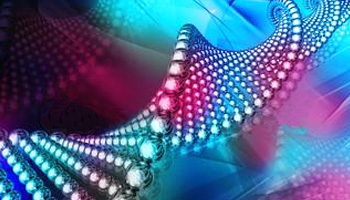 How is DNA synthesis initiated? What does DNA polymerase add the first incoming nucleotide to? An additional enzyme in DNA replication, the enzyme primase, synthesizes a strand of nucleic acid complementary to the template strand. 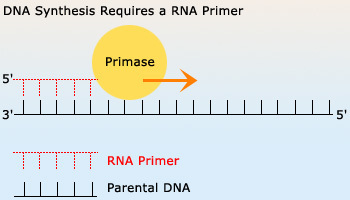 Primase generates RNA primers(10 nucleotide sequences complementary to the DNA) and does not require a free 3' hydroxyl. In the replication fork, DNA is unwound and replication is initiated by primase, which makes RNA primers complementary to both the leading and lagging strands. Since this is an RNA primer, the nucleotide uracil is used in place of thymine and is base–paired with adenine. For the leading strand, a single RNA primer is made and is then used by DNA polymerase to elongate the complementary strand. 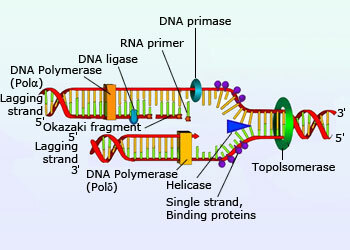 For the lagging strand, many RNA primers are used; one for each Okazaki fragment. 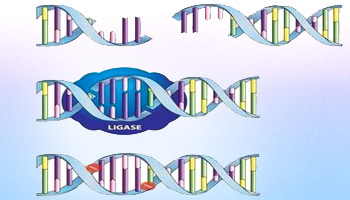 Role of DNA Ligase DNA ligase is a specific type of enzyme, that facilitates the joining of DNA strands together. However, none of the RNA primers will remain in the DNA; they are removed by an exonuclease and the gap that is created in the newly synthesized DNA is filled by a repair DNA polymerase, which extends the sequence of the adjacent Okazaki fragment. The two Okazaki fragments (now containing only DNA) are joined by the enzyme DNA ligase, which can form a phosphodiester bond between the 5' end of one DNA fragment and the 3' end of another DNA fragment. Thus, this is the basic principle for DNA replication for both prokaryotes and eukaryotes. In Eukaryotes, DNA replication occurs in nucleus More and more evidences show that the nuclear structure plays an important role in regulating DNA replication. The nuclear structure provides a physical barrier for the replication licensing, participates in the decision where DNA replication initiates, and organizes replication proteins as replication factory for DNA replication. Bacterial (Prokaryotic) and eukaryotic cells share many of the same basic features of replication; for instance, initiation requires a primer, elongation is always in the 5'–to–3' direction, and replication is always continuous along the leading strand and discontinuous along the lagging strand. There are important differences also between bacterial and eukaryotic replication, some of which biologists are still actively researching in an effort to better understand the molecular details. One difference is that eukaryotic replication is characterized by many replication origins (often thousands), not just one, and the sequences of the replication origins vary widely among species. On the other hand, while the replication origins for bacteria, oriC, vary in length (from about 200 to 1,000 base pairs) and sequence, except among closely related organisms, all bacteria nonetheless have just a single replication origin. DNA replication occurs during the S phase of cell division. 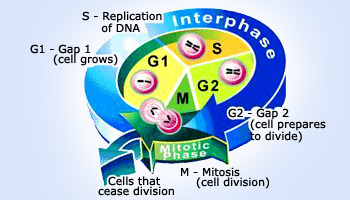 S-phase (synthesis phase) is the part of the cell cycle in which DNA is replicated, occurring between G1 phase and G2 phase. Precise and accurate DNA replication is necessary to prevent genetic abnormalities which often lead to cell death or disease. Eukaryotic replication also utilizes a different set of DNA polymerase enzymes (e.g., DNA polymerase ? and DNA polymerase ? instead of DNA polymerase III ( the major function of DNA pol–III is to synthesize the nucleotides in bacteria). Scientists are still studying the roles of the 13 eukaryotic polymerases discovered to date. DNA replication occurs during the S phase of cell division. In E. coli, this means that the entire genome is replicated in just 40 minutes, at a pace of approximately 1,000 nucleotides per second. In eukaryotes, the pace is much slower: about 40 nucleotides per second. The coordination of the protein complexes required for the steps of replication and the speed at which replication must occur in order for cells to divide are impressive, especially considering that enzymes are also proofreading, which leaves very few errors behind. Thus, DNA completes its replication and synthesis. An overview of DNA replication In general, DNA is replicated by uncoiling of the helix, strand separation by breaking of the hydrogen bonds between the complementary strands, and synthesis of two new strands by complementary base pairing. DNA replication is semiconservative, and each strand of the double helix serves as a template for synthesis of a new strand. Replication of DNA is initiated at specific origins of replication (Ori sites), and replication forks move bidirectionally. . DNA replication is initiated by proteins, which assemble at the ori sites. This includes helicase, which locally unwinds the DNA, and single–strand binding protein (SSBP), which binds the single–stranded portions of the DNA and inhibits renaturation. DNA synthesis is catalyzed by the enzyme DNA polymerase, which is only capable of elongating a strand of DNA in the 5' to 3' direction. As a result, the synthesis of one strand (the leading strand) is continuous, and the synthesis of the other strand (the lagging strand) is discontinuous; the latter resulting in Okazaki fragments. In addition, DNA polymerase has a proofreading activity that detects and removes mismatched nucleotides before proceeding with synthesis. DNA polymerase can extend a DNA strand but cannot initiate synthesis. After completion of DNA replication, new copies automatically wind up again Each parent strand serves as a template to synthesize a complementary copy of itself, resulting in the formation of two identical DNA molecules. An enzyme called helicase unwinds the double–stranded DNA. Several small proteins called single strand binding proteins (SSB) temporarily bind to each side and keep them separated. A subunit of the DNA polymerase proofreads the new DNA. An enzyme called DNA ligase seals up the fragments into one long continuous strand. The new copies automatically wind up again. From DNA to Protein A cell's DNA contains the instructions that govern the cell's protein production, growth, positioning, and many other factors. The purpose of DNA replication is to duplicate the DNA within each cell during every cycle of cell division. One of the most important parts of this process is error checking and correction. A cell's DNA contains the instructions that govern the cell's protein production, growth, positioning, and many other factors. Even slight errors in DNA replication can cause potentially harmful changes in the cell's behavior. Extensive and redundant error checking mechanisms are built into the replication process, ensuring that, despite the fact that replication occurs in many cells in the body at any given moment, errors are very rare. 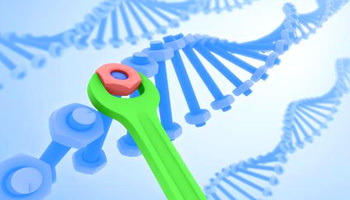 DNA Repair One of the most important functions of DNA replication is error checking and correction, which is also referred as DNA repair or Proof reading. Different types of cells replicates their DNA at different rates. Some cells constantly divide, like those in your hair and fingernails and bone marrow cells. Other cells go through several rounds of cell division and stop (including specialized cells, like those in your brain, muscle and heart). Finally, some cells stop dividing, but can be induced to divide to repair injury (such as skin cells and liver cells). Thus, DNA replication involves an incredibly sophisticated, highly coordinated series of molecular events. The study of DNA replication started almost as soon as the structure of DNA was elucidated, and it continues to this day. Currently, the stages of initiation, unwinding, primer synthesis, and elongation are understood in the most basic sense, but many questions remain unanswered, particularly when it comes to replication of the eukaryotic genome.